Before the Lord Jesus was ascended into heaven, He told the disciples not to leave Jerusalem but stay there for the Promise of the Holy Spirit to come on them. The Lord Jesus said to His disciples, “You were baptized with water by John, the Baptist but the Holy Spirit will come on you a few days from now. Go everywhere and preach the gospel to the people in all the places. Everyone that believe and is baptized in the Holy Spirit, in the Father and in the Son will be saved. My followers shall cast out demons and speak the tongue language. If they are bitten by a poisonous snake, nothing will happen to them. After this, the Lord Jesus was taken into heaven. The Lord Jesus sat at the right hand side of God’s throne. 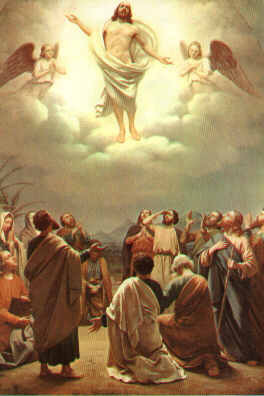 While the Lord Jesus was rising into the heaven, the disciples were looking. While they were still looking above, an angel clad in white shinning clothes appeared and said to the disciples, “Why are you still looking? Then the disciples went out and preached the good news to the people. The Lord Jesus was with the disciples, confirming the word they preached to the people with the miracles and wonders they performed.